The term aquatic can be applied to animals that live in either fresh water (fresh water animals) or salt water (marine animals). 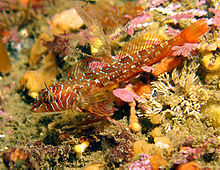 However, the adjective marine is most commonly used for animals that live in saltwater, i.e. in oceans, seas, etc. Aquatic animals (especially freshwater animals) are often of special concern to conservationists because of the fragility of their environments. Aquatic animals are subject to pressure from overfishing, destructive fishing, marine pollution and climate change. In addition to water breathing animals, e.g., fish, most mollusks etc., the term "aquatic animal" can be applied to air-breathing aquatic or sea mammals such as those in the orders Cetacea (whales) and Sirenia (sea cows), which cannot survive on land, as well as the pinnipeds (true seals, eared seals, and the walrus). The term "aquatic mammal" is also applied to four-footed mammals like the river otter (Lontra canadensis) and beavers (family Castoridae), although these are technically amphibious or semiaquatic. Amphibians, like frogs (the order Anura), while requiring water, are separated into their own environmental classification. The majority of amphibians (class Amphibia) have an aquatic larval stage, like a tadpole, but then live as terrestrial adults, and may return to the water to mate. Certain fish also evolved to breathe air to survive oxygen-deprived water, such as Arapaima (family Osteoglossidae) and walking catfish. Most mollusks have gills, while some fresh water ones have a lung instead (e.g. Planorbidae) and some amphibious ones have both (e.g. Ampullariidae). "Annelids." Nonindigenous Aquatic Species. Web. 2 May 2012. <https://web.archive.org/web/20120606154809/http://nas.er.usgs.gov/taxgroup/annelids/>. National Invasive Species Information Center. Web. 2 May 2012. <http://www.invasivespeciesinfo.gov/aquatics/main.shtml>.